You should be redirected automatically in a few moments, but if not, please click here to see if New Scottish Royal Commission database has made the transition. 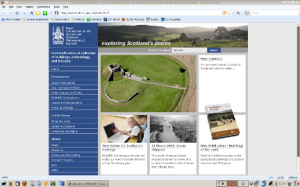 The Royal Commission on the Ancient and Historical Monuments of Scotland (RCAHMS) have redesigned and relaunched their website. From here you can search five of their databases: Canmore, PASTMAP, Scran, AirPhotoFinder and HLAMAP (explanations of each are on the website). Each record pulled back from searching links to all relevant photos in their database, along with reports and relevant books in a bibliography. The new design looks smart, is easy to navigate, and for those (like me) for who it is important, the site works cleanly without images and CSS loading. It should work well with screen readers. I’ve not used one myself, but if you have any comments about this or other sites with that technology, feel free to vent below!